Will the movers disassemble and reassemble my furniture? Our goal is to make your move, whether its a local move or a cross country move as simple and easy as possible. So whenever possible we will take apart your larger bulky furniture. Traditional beds with headboard, footboard and side rails are no problem for us. We can also take apart your dining room tables and sectional couches and most desks. Many customers ask us if there are any tips to save time or money on the move. One way to do so is to have these items taken apart in advance. We have absolutely no problem taking these items apart for you, but it does take time. Typically our estimates will include the time to break down and reassemble these furniture items. There are some items that we are unable to break down or reassemble for liability reasons. We do however work with 3rd party experts that we can contract on your behalf. Additional charges will apply. We are unable to breakdown or reassembly cribs under any circumstances. We can not break down some bunk beds. If the bunk beds is a very simple bed on top of another bed, that is totally fine. If the bunk bed is an elaborate system with built in stairs, landings or storage, we will be unable to assist you. Beds with intricate storage systems or sleep number / craftmatic beds likely will require a 3rd party specialist. 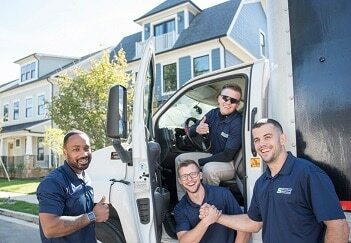 We are experts in all things moving, but we do not always have a trained and skilled technician to handle more advanced breakdowns. Consult with your local office on specific furniture policies. We are unable to breakdown exercise equipment, so if your elliptical or treadmill must be broken down to get in or out of either location, please let us know in advance so we can get a price for 3rd party solutions. We strongly prefer that garage / basement storage racks are broken down prior to our arrival. We can manage this for you, but certain style can take quite a bit of time. We would prefer to focus on the heavy lifting and not have to charge your for the time spent breakdown each shelf. We can not break down ikea style wardrobes. Often times these are too large to fit down stairwells. These larger armoires / wardrobes are not designed to be broken down after initial assembly. There are a lot of hardware pieces to these and they often get lost. They also lose structural stability when broken down again and again. We can do our best to maneuver these pieces in and out, but please understand that it may not be possible to remove them from your current home while in tact. If you are going to break down any furniture yourself to save time, we strongly recommend placing all hardware in a ziploc bag for safe transit. Please keep in mind that it is up to the crew leader discretion on reassembling any furniture that we did not dismantle ourselves. We are happy to move appliances for you, but we cannot disconnect any live electrical wiring or any plumbing / gas lines. Please make sure all appliances are disconnected 24 hours in advance to allow for any defrosting as well. If you need any assistance with rare or unique items like pinball machines or soda machines, please let us know well in advance so we have an opportunity to develop a game plan and contract any third parties.